God created mankind to live among each other since we are in the image of God. God is community being three persons in one being (the Trinity). As such, we are created to be in community, even specifically a city. Cities are geographical areas with a larger population of people in walking distance to various means of commerce and homes. The story of the Bible begins with a city and ends with the eternal, perfect city to come. In the mean time, people coming to belief in the Creator God become like him by seeking to serve, love and enjoy city life as Jesus exemplified. Get to know Tabernacle’s city of Roseville, CA and learn to serve our neighbors for the sake of the eternal city to come, the home of God – Heaven. Searching the City of Roseville, CA website homepage, the about us, jobs, library and parks pages provide helpful, short, and concise information revealing the history, heritage, heart and haven of Roseville. Wikipedia provides another perspective to Roseville including geography and demographics. 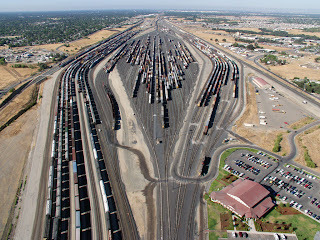 More so, Roseville, California’s massive railroad yard proves to be a mainstay and heritage attraction for all ages.